The assignment is to attend a speech, take notes and report in essay format on the speech. You are probably wondering "where can I find a speech to attend?" Get creative, go to a city council meeting, school board meeting, political event - you have to actually physically be in the room with the speaker!! It cannot be at church, or a classroom lecture! Below are several questions you may want to consider to guide your essay. Prepare a two page essay on the speech. Please start your essay with the title of the speech along with the name of the speaker and occasion. they are due at the BEGINNING OF YOUR CLASS!! The outside speech evaluation due date is listed on the extra credit page. 1. What was the nature of the public speaking event? What was the general function and purpose of the speaker’s presentation? Was it appropriate given that event and the audiences’ likely expectations? 2. What were the speaker’s main points and major supporting materials? Were the main points well supported with reasoning, a variety of supporting material, and effective language use? 3. Were the speaker’s main ideas easy to follow? Were they organized into a coherent design? Did the speaker use transitions well? 4. Did the speaker gain attention with the introduction and provide a sense of closure in the conclusion? 5. Was the speaker’s presentation style effective? Did she or he speak extemporaneously, from memory, or from a teleprompter or manuscript? Did he or she make effective eye contact, and did movements and gestures complement the tone of the message? Was his/her voice loud enough to be heard and varied enough to enhance the message? 6. 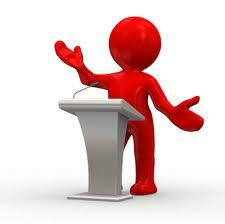 In general, what do you think were the strongest and weakest aspects of the speaker’s presentation? 7. What constructive advice would you give him/her for future presentations?